Goffstown has decided to postpone today’s town election until Saturday. Because Goffstown High School is one of the voting locations in Goffstown, we will not be able to hold the Goffstown Regional Tournament on Saturday as originally scheduled. We will need to use the snow date, and hold the tournament on Sunday. Only the date will change. The tournament will still be held at Goffstown High School, and the times shown on published schedules will remain unchanged. If there is any additional information that we need to share with everyone, we will post it on the Goffstown Regional Tournament home page and on our Facebook page. Please try to check on a regular basis for any updates. 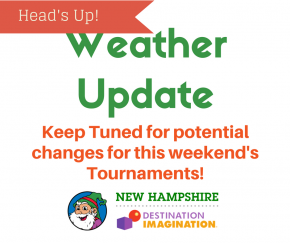 Today’s storm will not affect the Swanzey Regional Tournament, which is still scheduled to take place on Saturday.